The joys of cruising are diverse and there is something about every day that brings one type of benefit or another. The last two days have given us both ends of the rainbow. Saturday we arrived in Bigovo, a small quiet town in a big bay in Zaliv Traste. The bay captured every breeze and we had a swim before lunch on Mercier. We then unloaded the zodiak and motored to the village. A local came and took our lines and told us to tie up to the dock and helped us ashore. We went to the a stone cafe with open rooms in deep shade to have a drink. The cafe was filled with curios and artifacts, the ceiling was a mass of nets like sharks fins. swordfish bills and a giant lobster carcapace. The walls held photos of fish that had been caught and dogs that kept the fishermen happy. Alas no Aperol Spritz! Mineral water and beer had to suffice. After a small walk along the waterfront, Louise swam back to Mercier, while we motored back for a swim. Once back on Mercier we were all in the water, beating back the heat of the day and enjoying the quiet relaxing pace of Bigovo. 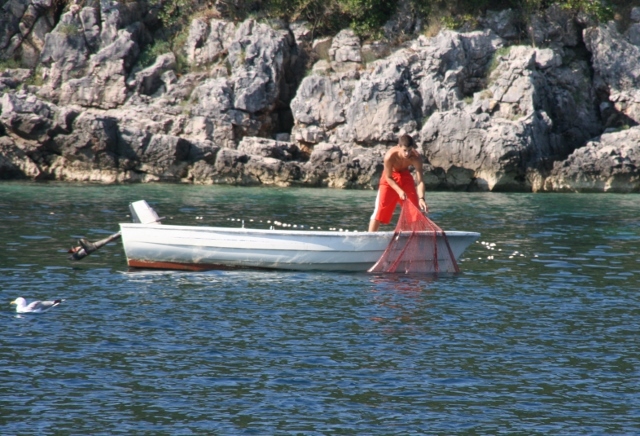 In the cool of the evening, we watched a young fisherman lay his nets in the sunset. 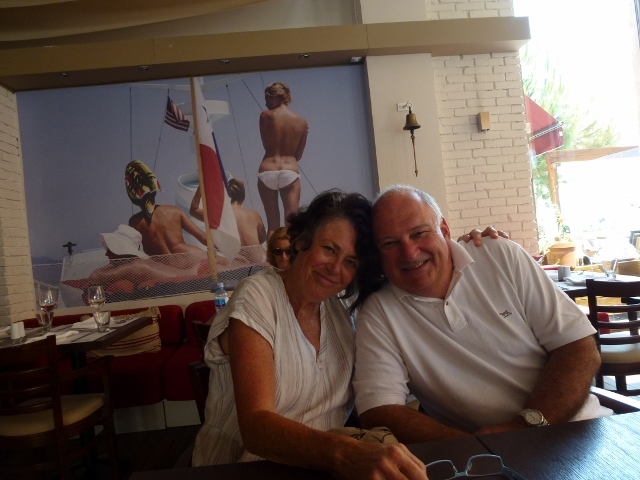 On Sunday, we had a short , leisurely motor to Porto Montenegro, a new, terribly- swish resort. This may have been the nicest marina we have been in, clear instructions on where to go and ultra-clean modern facilities. Wonderful showers are available, something those at home might not even consider, but luxury here. 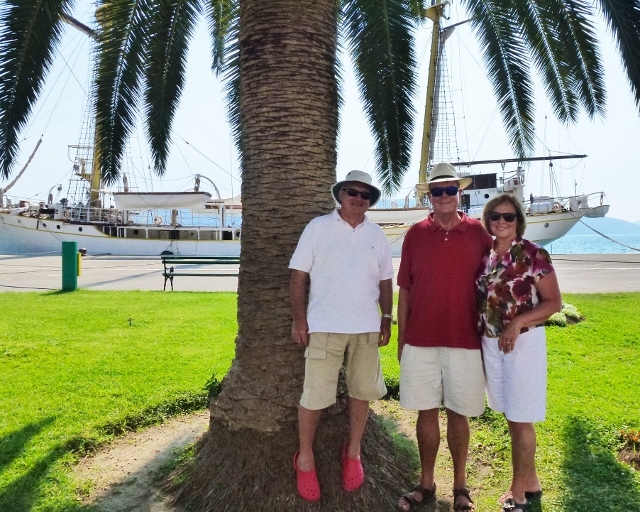 We walked to old Tivat, but it was hot and Sunday and hot. Great shops, markets and wonderful cafes and some of the best ice cream we have had en route. Louise and Gaila did a tour of some lovely shops (lovely airconditioning) and purchased sarongs. As glamourous as it is, you can’t jump into the marina to swim and cool off and the boat doesn’t swing to capture the breeze on the bow. Here’s the thing, we have enjoyed both immensley. We sailed through the confused seas off of Capo Santa Maria di Leuca, the point where the Ionian Sea and the Adriatic Sea meet. It was confused for several hours and not terribly comfortable. The large yellow moon was so bright that the stars were very hard to see. Louise and I thought we would take photos. All the caveats for photography of night skies were broken – what good is a tripod on a lurching boat. We could barely keep the moon on the screen, our cameras turned into game consoles. We were giggling and shreiking as the red globe careened over the camera frame. Midday the next day, we sailed into the Port of Bar, Montenegro. It is a very picturesque harbour and town, mountains coming down to meet the sea. 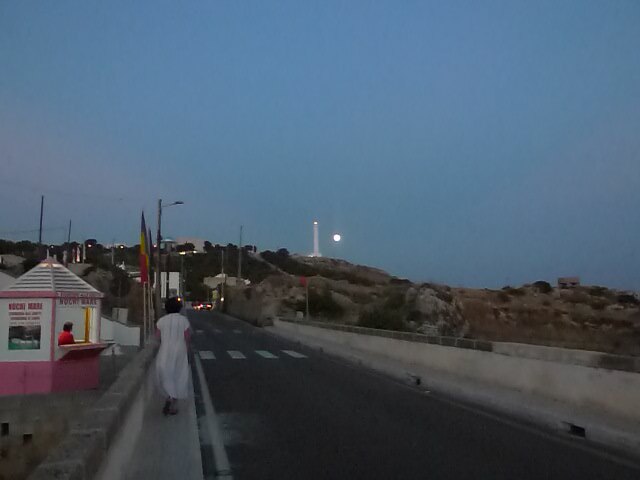 The biggest activity seems to be a passeggiata at sunset, the whole town is out for a walk. During the afternoon it was very quiet but by night Bar comes alive. 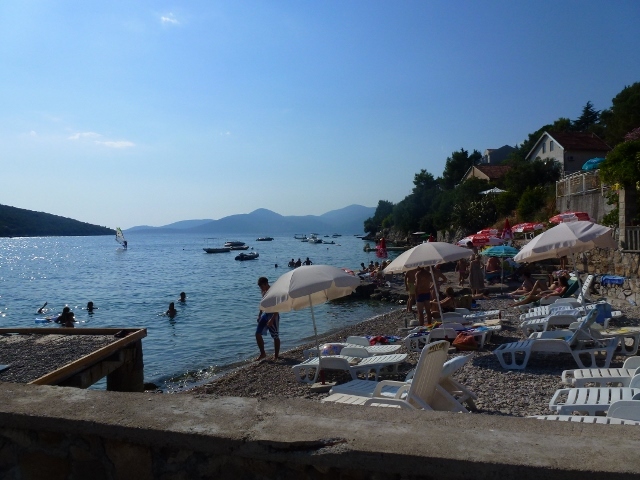 Yesterday we left Bar and sailed northwest for a swim in Uvala Canj and then lunch. It was a beautiful spot for a swim and Mercier makes it easy to get off and on the boat. The water is very deep, so has a beautiful warm float on top of a very chilly pond of water. Frosty’s towel must have blown off the rail and you could see it so clearly, he thought he would just be able to swim down and grab it. He realised once he hit the cold water and was no closer that it was 9 metres below us. That towel is Frosty’s gift to Montenegro. 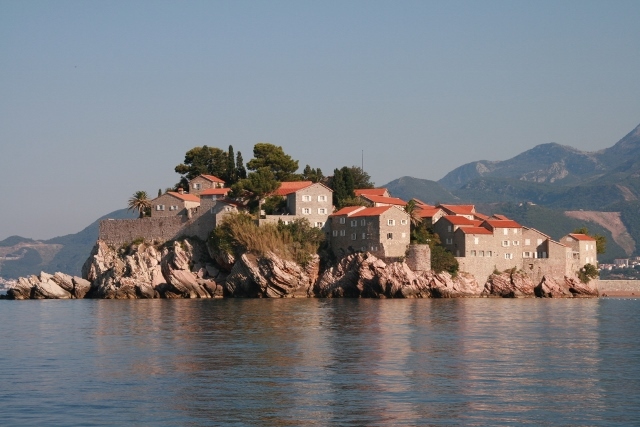 After lunch we sailed a few more miles to the most photographed island in Montenegro, Sveti Stefan. 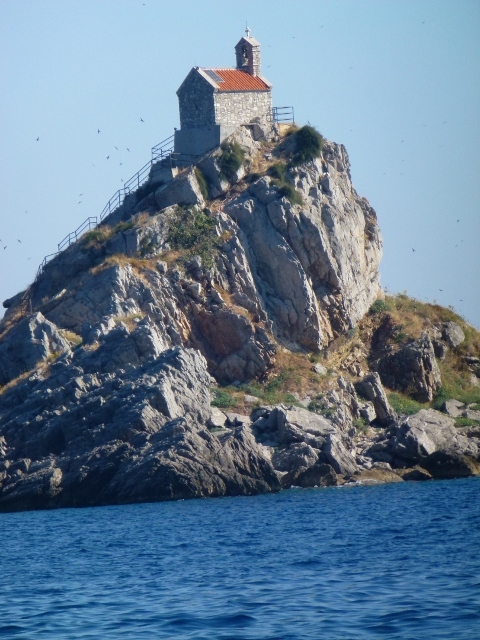 Financed in the 15th Century by reclaiming loot from pirates, a family was able to buy the island, fortify it and build a church. In 1952, the whole island was converted to a luxury hotel. No cajoling could tempt James into leaving the boat, but the resort does look historic and luxurious at the same time. 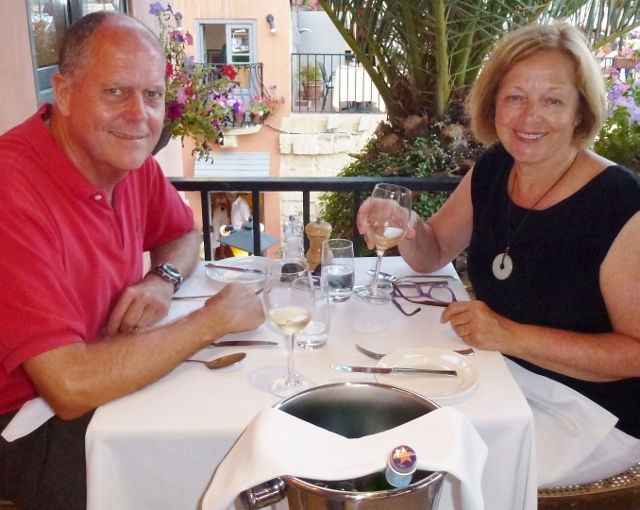 Finally, to John and Jenni, so sorry to hear about your bingle, glad you are safe and sound in Italy. Recuperate quickly, enjoy being pampered and then enjoy Italy. 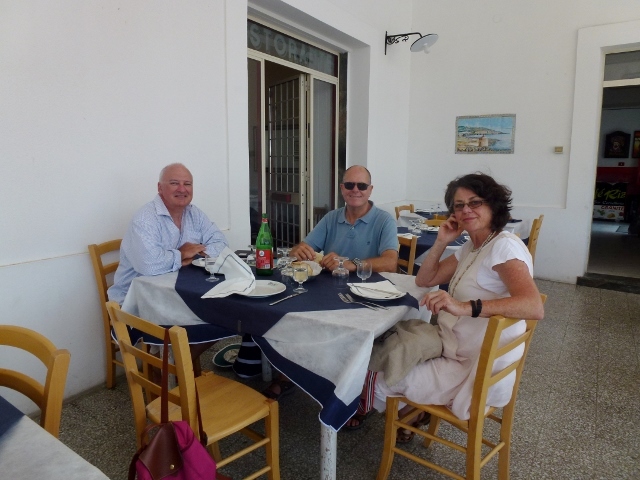 We had a stopover in Calabria at the Marina of Roccella Ionica. 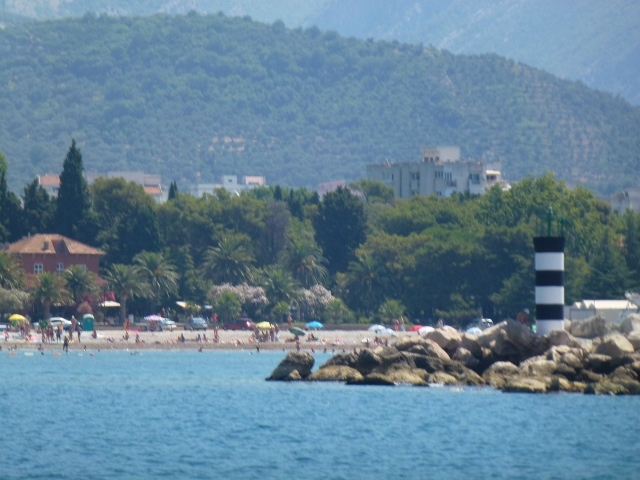 We had heard that silting to the entrance of the harbour could be a problem and we should stay to the left. Since a yacht, just about the same size was stuck in the middle of a sand bar, we thank Heikell for the information. He is rather like a patron saint of yachties in the Med. On this approach, you could see who read Heikell and who was stuck on a sandbar. Upon entering, we found a small tidy marina of Roccella Ionica run by Francesco Lombardi. We were assisted with getting our documents stamped by the Coast Guard and information given about the nearby restaurant. Since we had arrived just hours before sundown, we were in a queue of boats. It was like Friday night on the harbour bridge. He did get everyone’s papers processed. There was a great energy and a great welcome to Marina of Roccella Ionica. We dress and walk around the marina to the restaurant. There were hundreds of people from the local community as well as many yachties, sitting under a large waxing moon at the outdoor tables. There were tables for twenty and tables for two, children and puppies wandered through the table. Pizza was served, not by a slice or a pie but in either a half metre or metre, on a long narrow board. We had fish and pasta but everyone’s food looked good. The camaraderie of whole families in the restaurant, children playing clap hands and dancing, wishing Auguri for someone’s birthday, made for a fairytale evening. 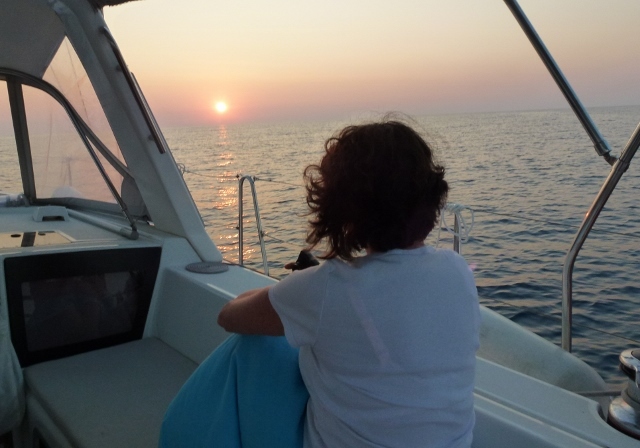 Another early start found us sailing for ten hours to Santa Maria di Leuca. We all keep watch for lobster pots and ships, but James and Louise do Sudoku. Louise is also sketching every day. Frosty and Gaila are writing and journaling. We also listen to talking books and podcasts. There is no small amount of chatting and cooking going on. What does it take to do ten hours of sailing a day? Chocolate and fruit. 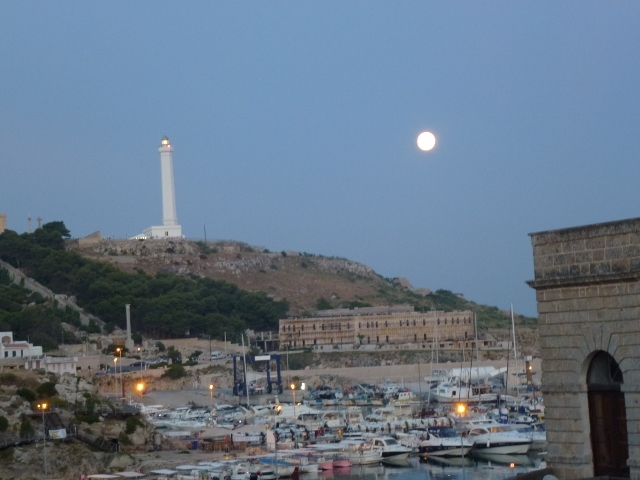 We arrive at Santa Maria di Leuca about 5:00pm. As we sail in, the brass band strikes up an Italian song and we are wondering why they are so excited by our arrival? Ah, but no. It is the boat behind us with a large number of Italian Youth Sailors, who are circumnavigating Italy and being feted at different ports during their summer holidays. We shower and go straight out to a lovely restaurant, walking under the full moon, which was extremely large and beautiful. As we go, we pick out the house we want for our Italian fixer upper. There are some beautiful houses here and lovely gardens too. We all have a favorite, each usually a bit run down but quite grand with colonades. Our last meal in Italy. The next morning, James goes with all our paperwork and hands in our Italian cruising permit. The border patrol actually drives to us from about sixty minutes away, saving us a long sail to Brindisi. They stamp us out of the EU, we are off to Montenegro. Just one last gelato before we go! With Frosty and Louise on board, we are putting a lot of miles under our belt. 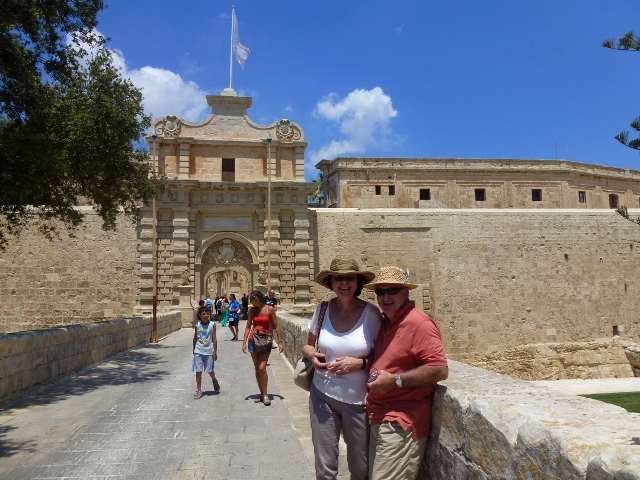 We left Malta and sailed north to Siracusa, where we stocked up on food and drink and sent Louise and Frosty in to Ortigia Island to wander the Triqs or small streets of the historic center. They promised they didn’t miss one. We had a lovely seafood dinner in the narrowest of alleys, with tables running down either side, so that the waiters and passersby had to turn sideways to move by. 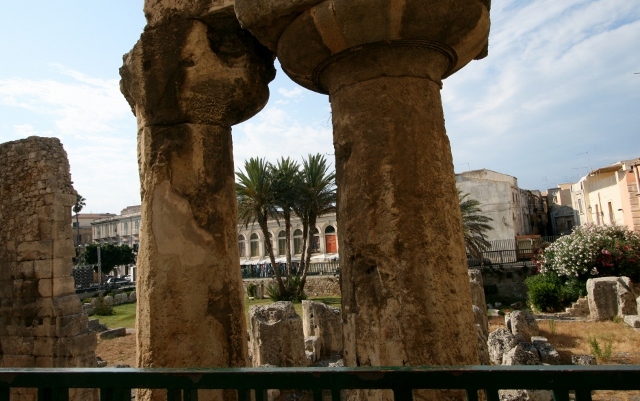 We left Siracusa at dawn, the white stoned city was awash with the dawn’s rosy red light. 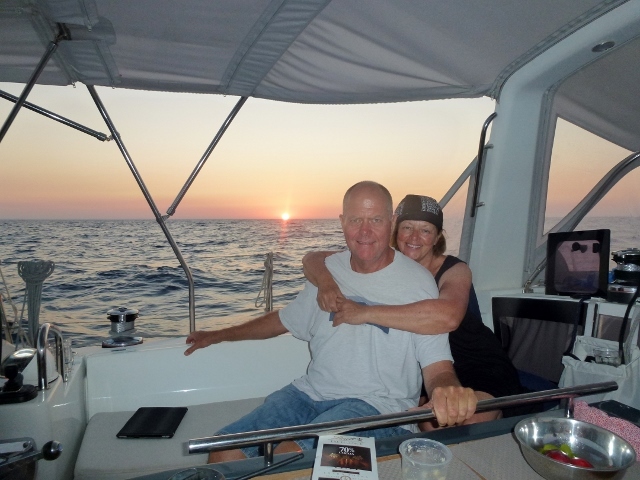 On passage, you are motor sailing or sailing, not really stopping until late afternoon or sunset. Time is passed by seeing other vessels and creatures of the sea. First the creatures, yesterday we saw two Beluga whales, they were very snub nosed and a bit mottled in colour, not pure white. They crossed our bow so languidly, we had to change course, so as not to collide. 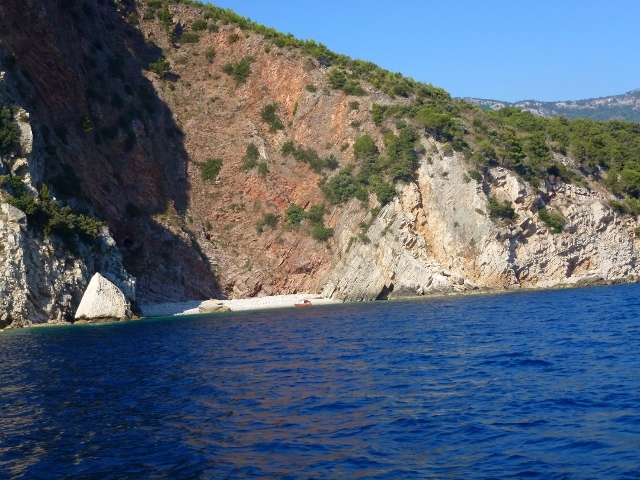 They were beautiful in the clear blue Ionian Sea. Sadly no photos, the seas were confused and the cockpit wet, so all the electronics were down below. 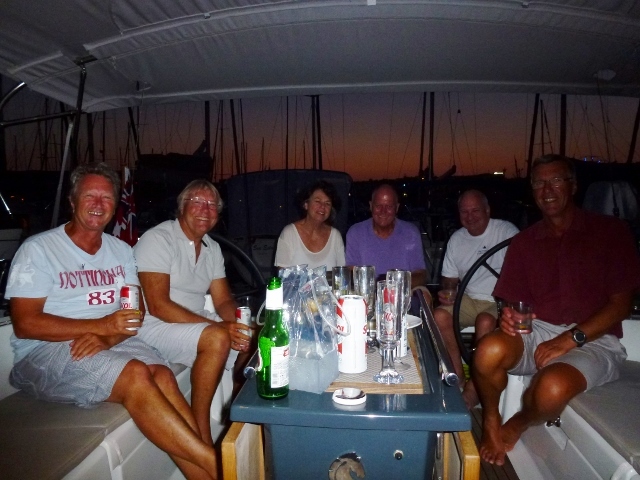 We had a great sail, 8 knots for seven hours in a very confused seaway. Mercier handled it well. We have seen many flying fish and the dolphins have been coming over most days for a cursory nod hello, before returning to herding fish. We have also seen a sunfish. First thinking we were seeing a shark, it flipped over and we could see it was a sunfish. Happy we didn’t hit it as they eat jellyfish, that has to be a good thing. How do we get a sunfish into Jerusalem Bay to clean up some of those jellyfish? Here are some photos of vessels who have made our day. Our Bling boat was a Pirate Go-Fast motor boat. 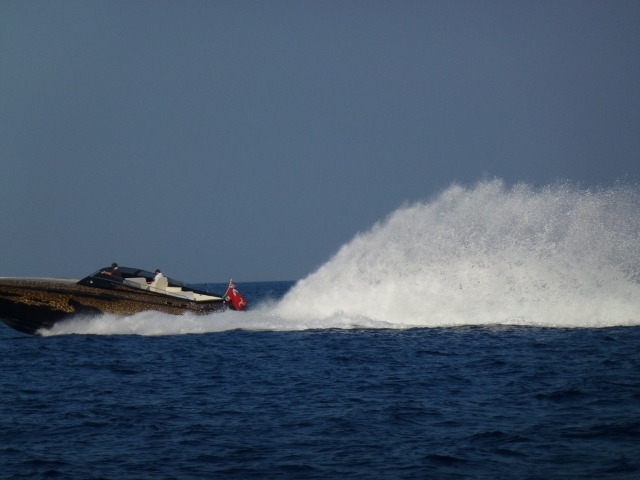 Our image of a drug smuggler’s boat. We didn’t think he was running drugs or cigarettes, as the gold varnish and the panther on the side made him infinitely identifiable. As he passed us, he revved his engine to give us a rooster tail of great shimmering plummage. As we are sailing, the horizon is misty and a big ship will look like a silouhette until it comes a bit closer. This ship looked like a tower block. The procedure is to quickly check the plotter and see if the ship is named on AIS (Automated Identification System). This hulk wasn’t but James and Frosty got out the binoculars and decided that perhaps it may be a military vessel. Our AIS reports that we may be on a collision course of within 11 – 50 metres. Another check on the AIS, which now gives us a number, far short of the usual identifier, momentarily it changes again and it says “French Naval Warship”. We were then perused by their helicopter, which we could see take off from the ship and then circle us and then circle a wider perimeter. Frosty will give us a replay of the radio conversation. 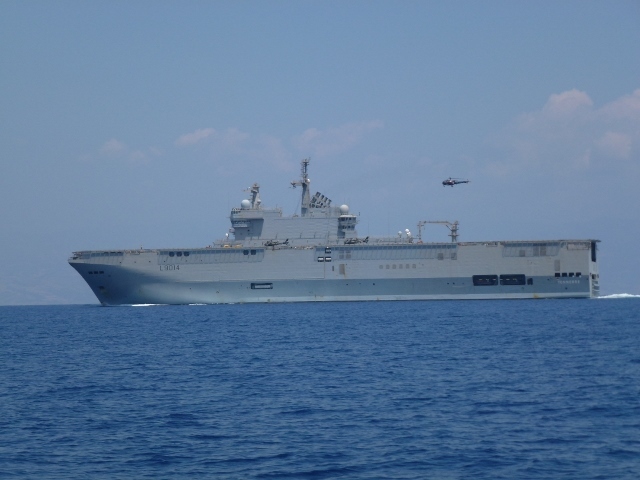 By that time, we had altered course to starboard, and slowed down, just as the French sped up and announced that they would alter course to port. It all passed without any collision, but the Italians were not keen to give way to the French within a mile of their own territorial waters, and it was good to know we rated as a “sailing sheep”. It was a small bit of excitement to break the monotony of a long passage. 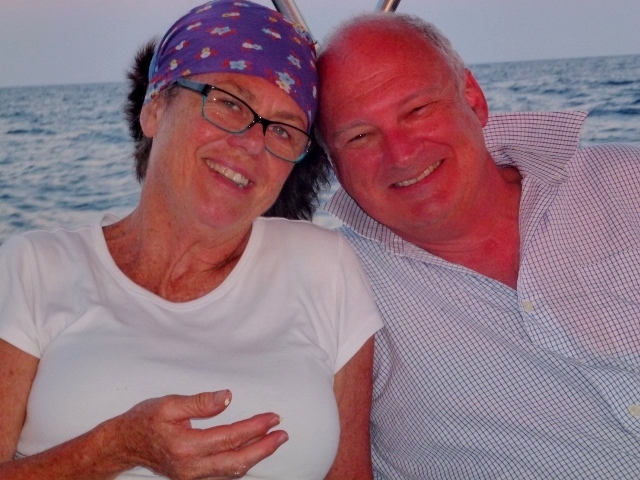 Happy Belated Birthday, Graham Bradley – forgive us for being late, but we lost connectivity for awhile there. Congratulations on being named head of Infrastructure NSW, we can sigh in relief knowing NSW will be in better shape when we return. In case, we lose connectivity again, Happy Birthday to my cousins, Ed De Angelo Jerry Johnson and Erin Gaffney, as well as our Greats Iris and Raffy. We wish all you July babies a very happy day. 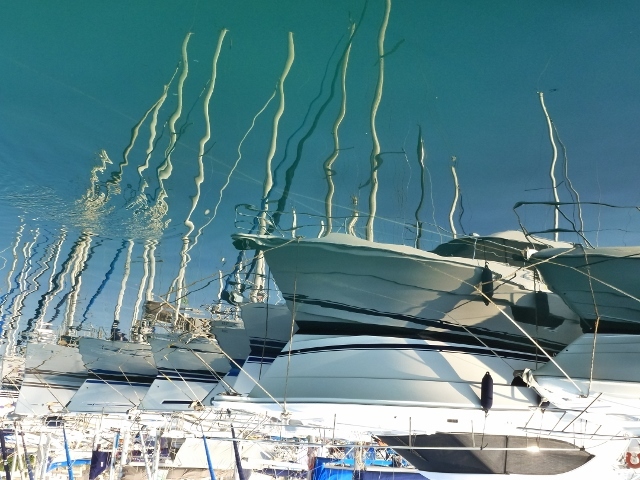 Nice calm start to the day- a leaking bilge can turn your day upside down. Travelling is wonderful. Even the problems you encounter are part of the journey. 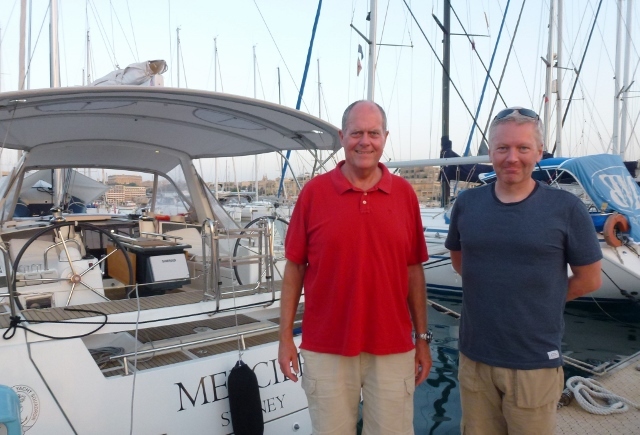 In Malta, you meet some some great Boating Technicians. The Beneteau dealers here provide excellent service. If you have Dock and Go issues, ZF in Malta are the only dealers we have found to diagnose the problem and quickly get parts in to repair and get us up and running. 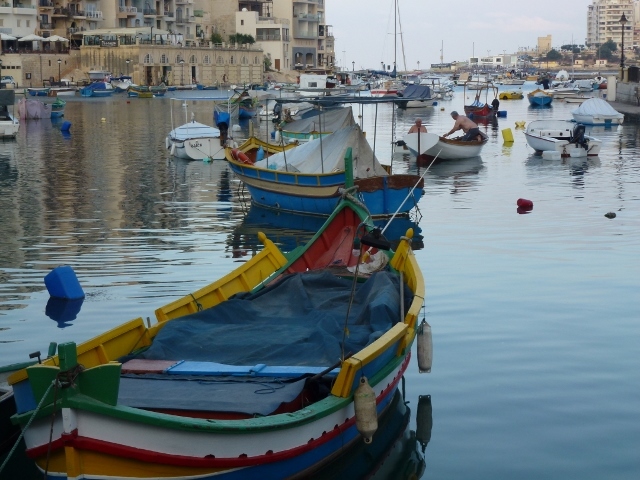 We can highly recommend Malta if you need boat repairs and supplies. They are qualified, helpful and personable; they speak English, which is a wonderful aid to communication for we language poor only-English speaking Aussies. When your friends visit, you can put them to work, Frosty and Louise arrived on Tuesday after 38 hours of travelling. Let us pamper you: a shower, a bit of fruit and an icy cold mineral water. Next we had out them walking on the boardwalk to wake them up and absorb the sunshine. 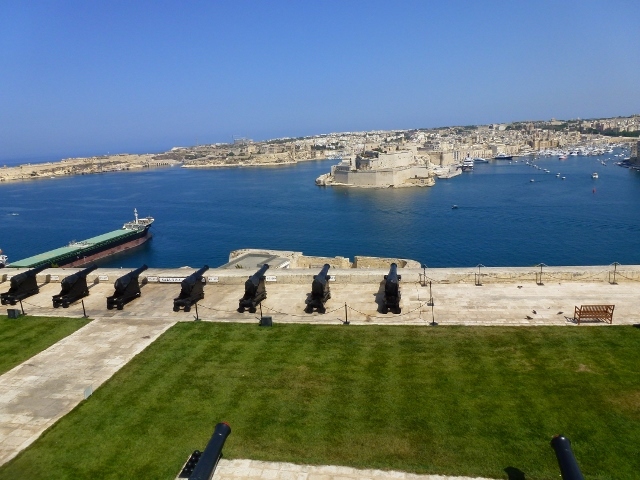 Lunch overlooking Valetta Harbour and then back to the boat to get their feet up and adjust to the time difference. On Thursday, there was no more molly coddling. A leak sprung up and let 300 litres of fresh water into the bilge. Frosty and James had to get to work, drain the bilge and then determine where the leak was. It was like a methodical engineering process, otherwise known in Aussie as “productive men’s shed session”. Amazingly, no advice was given, calm reigned and the leak was found (in the foot pump), fixed and hurrahs went up all round. We keep checking to see that there was just one leak, but all systems go. Thanks Frosty, welcome to your holiday. 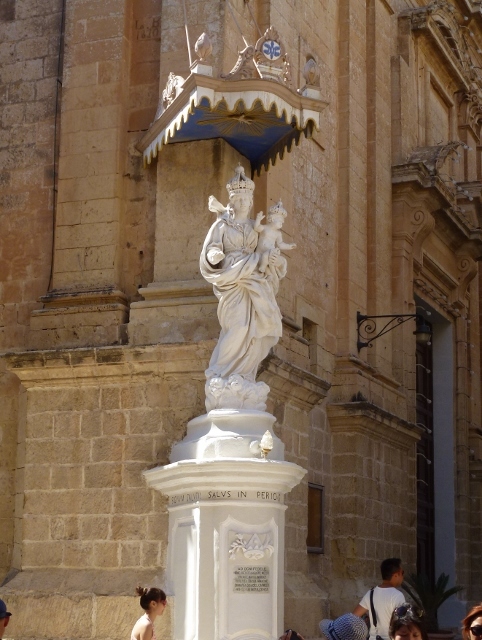 Thursday afternoon, we were free to go to Mdina and did some sightseeing. We then heard our friends from C’est La Vie were back and when we returned they were parked right next us. We got together and compared notes about where we had each been between our last visit. 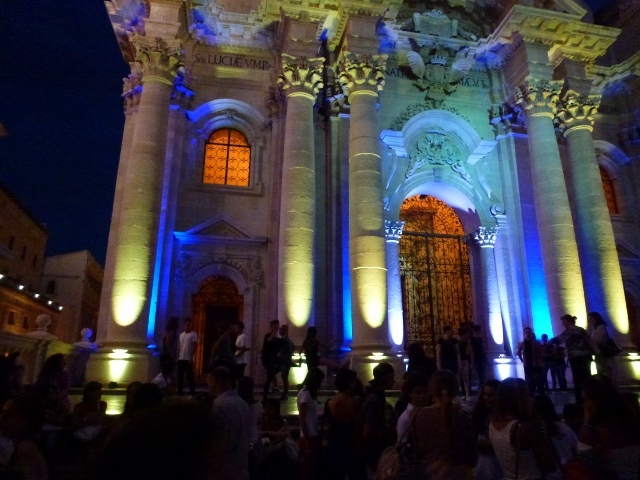 They loved Ragusa, so it’s now on our bucket list for the next trip. Ed Earl, you were on our mind and there were a few times during the day we celebrated for you. Glad you had a wonderful birthday. 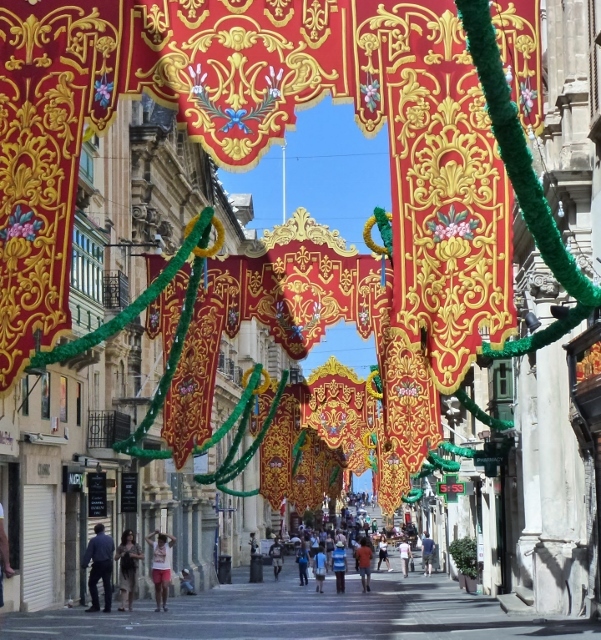 It is ‘festa’ time in Valetta and Malta, fireworks day & night, church bells ringing and general music playing at all hours of the day. 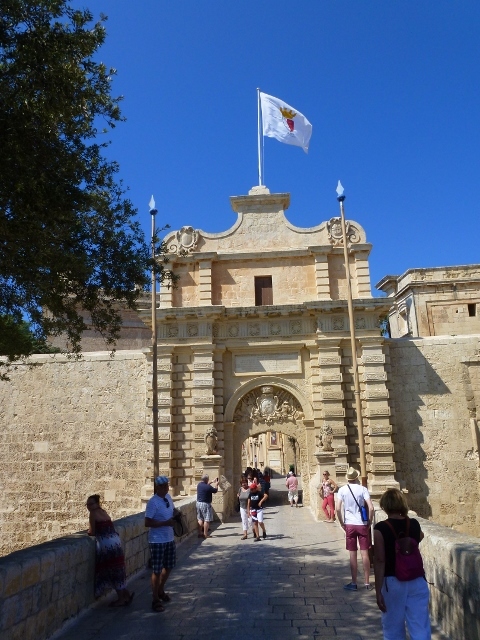 Yesterday, we decided to escape Manoel Island and go to Città Vittoriosa or Il Birgu on the Grand Harbour. 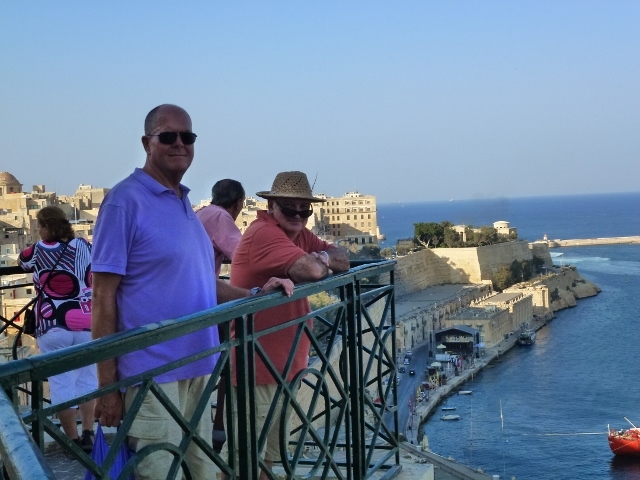 We took a bus to Vittoriosa and then took a traditional Maltese dghajsa or Maltese gondola across Grand Harbour. 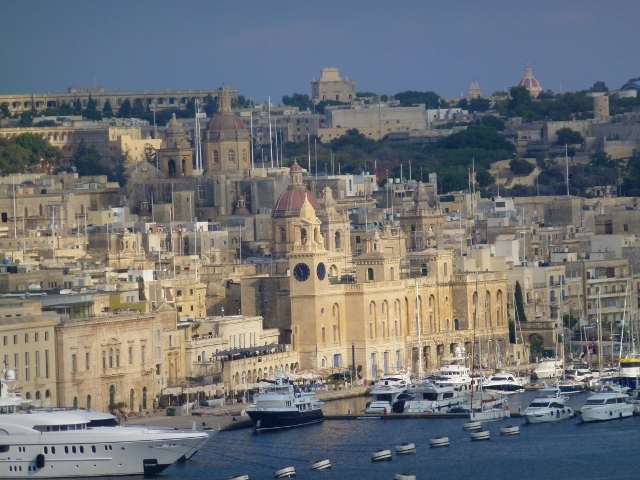 Grand Harbour is a huge natural harbour right next door to Marsamxett Harbour, which is where Mercier is berthed. 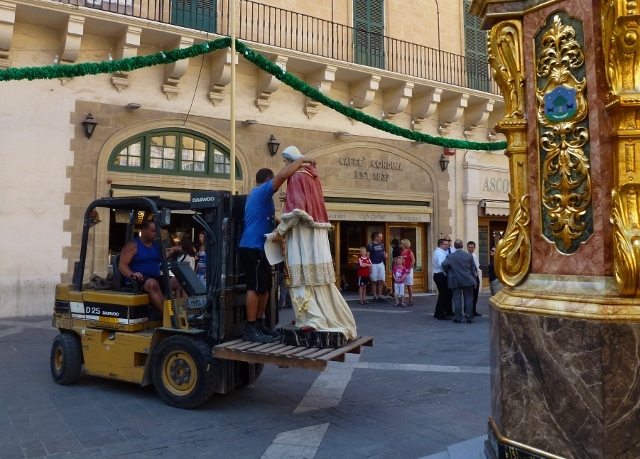 It was fun to see Il Birgu also dressed up for Festa where not only did they have church bells but a rave going on. Here we are in a small gondola, looking up at pontoons of Super yachts and Mega yachts. 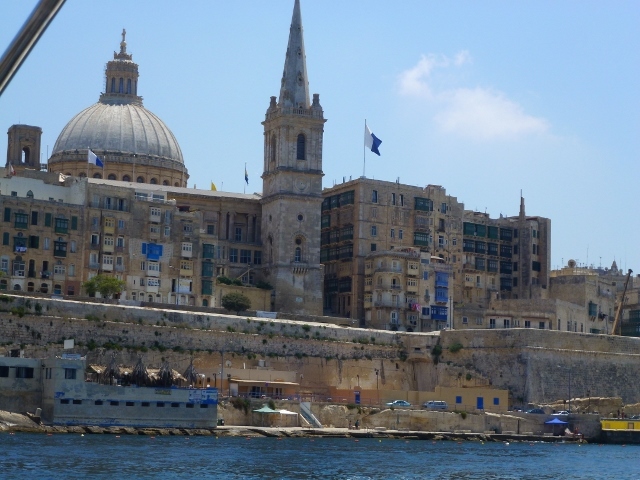 We are deposited in Valletta on the waterfront. 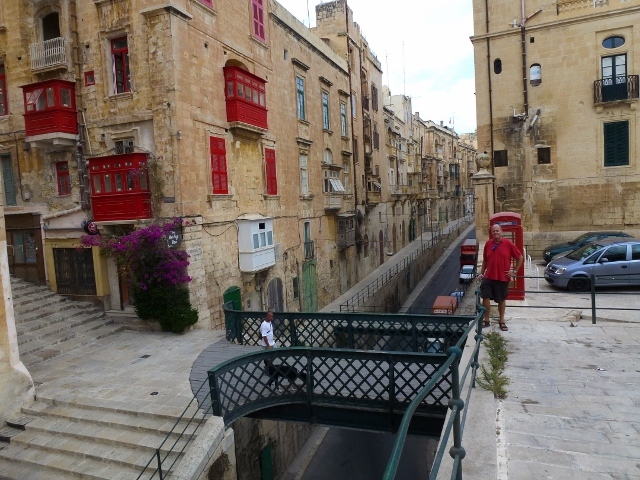 The gondola driver points to a big tower lift and says that will take us up to Valletta to Upper Barracca Gardens. Time to get back to Mercier and meet Stu Williamson, a great friend of John and Jenny’s. 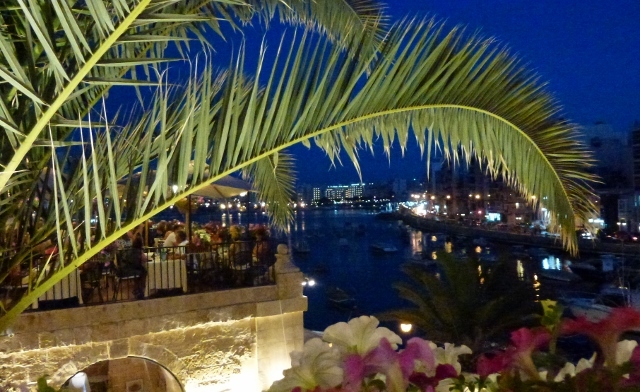 Stu is currently working in Malta and took us out and showed us a bit of Sliema, after a quick drink on Mercier. We have a sworn affidavit attesting the noise levels and the daytime fireworks. 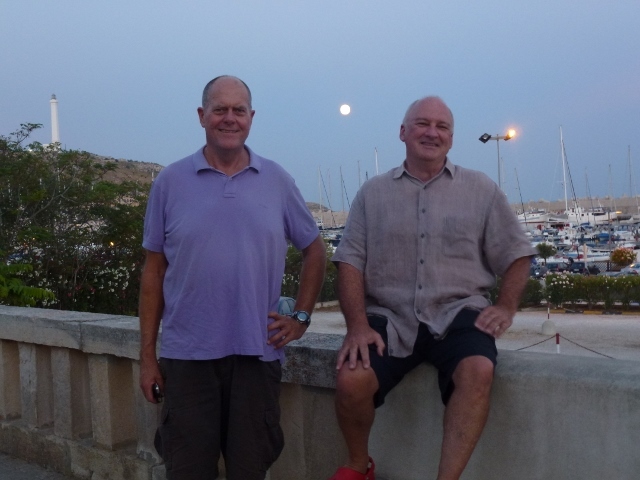 Stu has been in Malta for awhile and he couldn’t answer our question: why the daytime fireworks? either. Still sitting on the balcony in the evening, watching the moon rise over Valletta, with beautiful fireworks going off every ten minutes or so, we did enjoy the lights over the harbour and the very congenial company. Birthdays are coming up: Happy birthday Barbara for the 14th, glad you had fun in Berlin. Auguri Carmelita, for the 15th and Ed Earl, a very happy birthday celebration with great friends and most importantly – great advice. Very importantly, Bon Voyage to Frosty and Louise, travel safely. 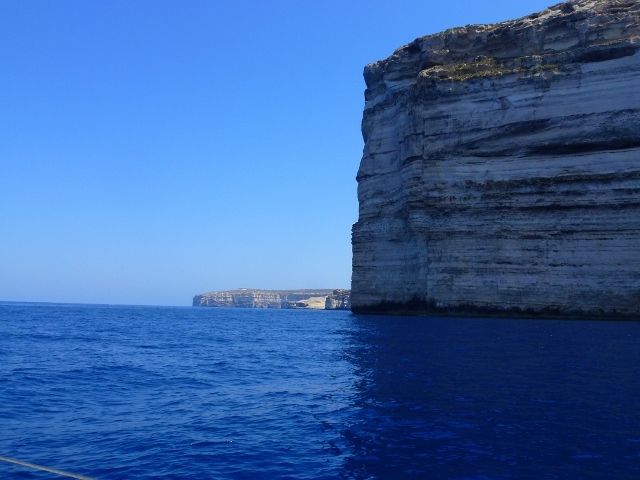 Gozo is small and quiet but with some jewel-like bays and a beach so beautiful that Odysseus spent seven years with Calypso here. The Big O sat on Ir-Ramla il Hamra, the golden red sand beach and missed his sweet Penelope while being held hostage by the nymph Calypso in a nearby cave. Luckily, Penelope was the original Pretty Woman, so he eventually made it home. As far as the beauty of Ramla Bay, you could be mistaken for thinking that you are in Palm Beach in NSW. The sand is a similar golden red and the water equally bright blue. Sailing to Dwejra Bay, we passed Xliendi Beach where we had lunch and walked the headland the day before. Dwejra is a collapsed cave, leaving a circular bay with two entrances/exits partially protected by a rock in the middle of the opening. Idyllic for a swim and lunch, we went early so we could make it back to Valetta before evening. 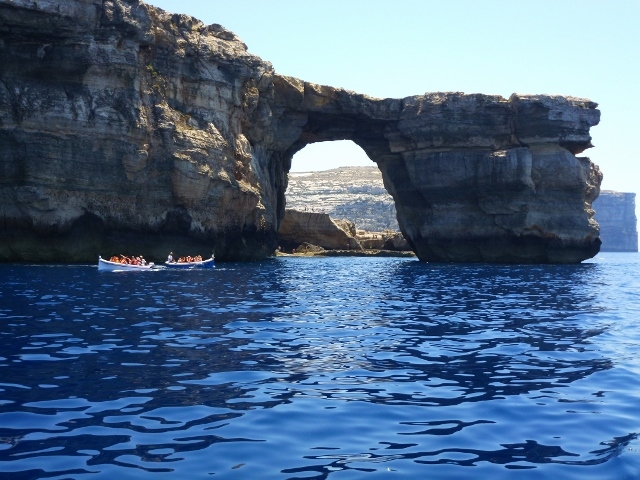 We were lucky to see the Azure Window at Dwejra. It is falling down bit by bit. It frames the view of the azure sea from land and the land from sea. There is a small market at Dwejra Bay and maybe a cantina, but its natural beauty sees every one visit by boat, bus or car. Malta and Gozo have a splendid bus system, beautifully air-conditioned and nice drivers. The island is small and you can take the bus and then walk. If it gets too warm, just take the round the city bus. We met a wonderful bus driver, who has an Australian wife. We were going down a narrow street, when we saw a wedding party leave for the church. The whole procession was being videoed, the street was too narrow for us to pass, so we waited and admired the wedding. We also admired the patient bus driver who didn’t want to rush the bride. If anyone tried to see the blog earlier today, the site was down because someone was trying to hack us. Funny since we probably have a readership of about 20 friends and family. We think its sorted out now. 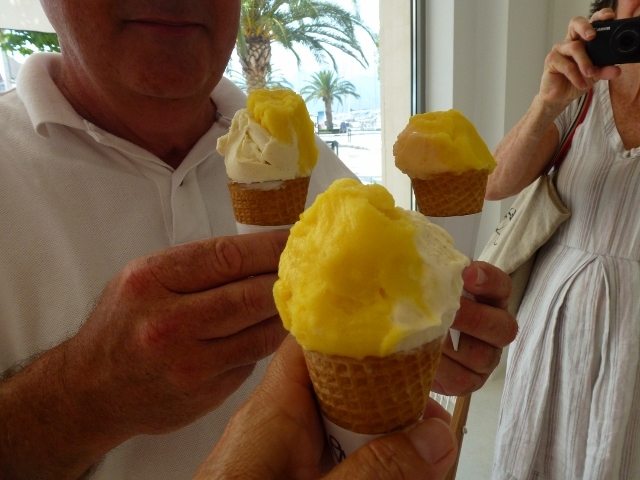 The other wonderful news is that someone let us know there is a good gelato shop in Sliema, we shall investigate. 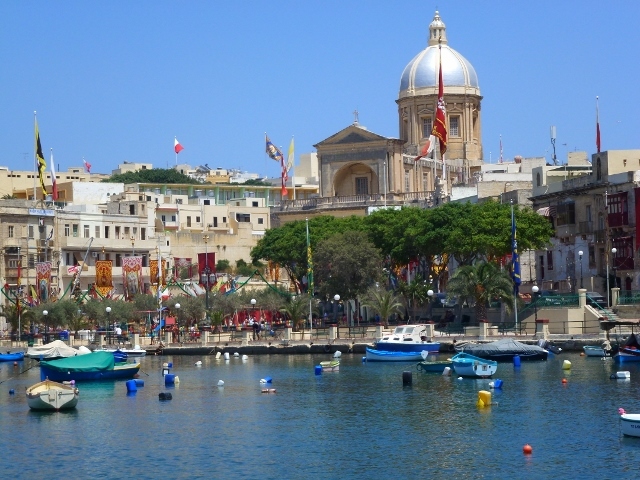 There are three inhabited islands in the country of Malta, Malta, Gozo and Comino. We have been touring around all three. 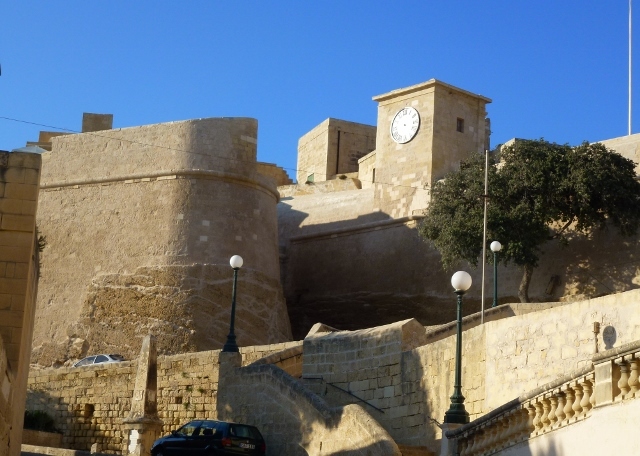 Mdina was the first capital of Malta, a walled fortress in the middle of the island, built by intrepid Phoenician sailors about 600 BC. 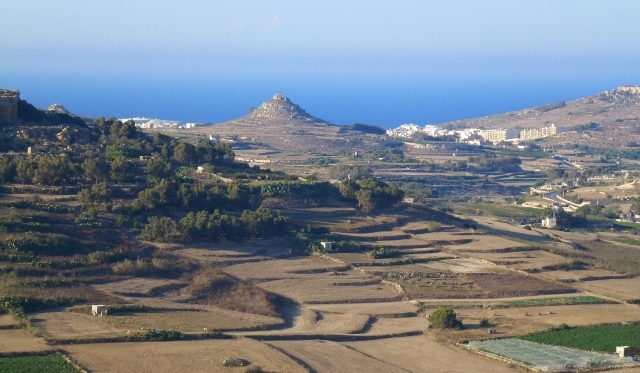 If you stand in the Citadel in Victoria on Gozo, a smaller island to the west of the island Malta, you see several hill top villages. This is what I think looking at the 7 Hills of Rome would have looked like in the Middle Ages. A church and houses on each hilltop, surrounded by walls, to keep the enemy out. Both hill top fortresses are still robust and stark in their beauty. They inform us that life was not easy and safety has always been an important factor in life. 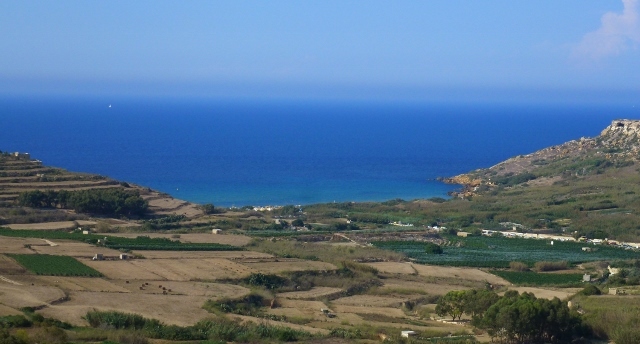 Gozo is very quiet compared to Malta, with lovely beaches and its historic hilltop towns. Comino is the small island between the two. Good marinas but the anchorages are very joggly. We stopped at Comino for a swim, first going to the Blue Grotto which literally overflowing with boats, several ferries with boom boxes and joy riding speed boats zooming past to add to the wash. We went to the next small bay next door and had lunch and a swim. 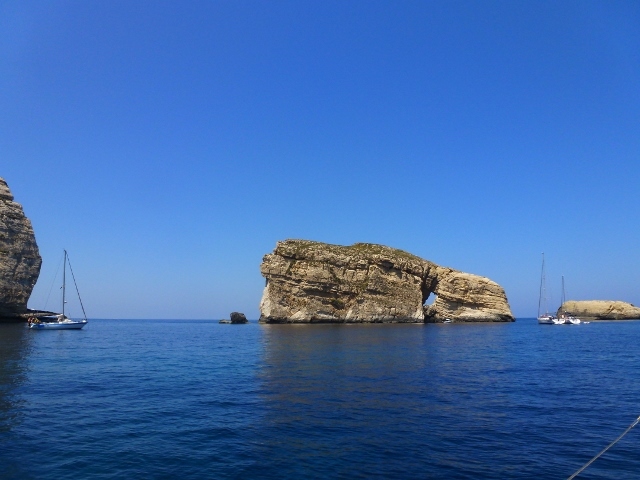 Today we will go and explore more in Gozo, have a swim and climb to see citadels. The one thing we have missed is gelato, it seems unnatural to climb all those stairs without it. They do have ice cream in Malta, but it’s just not the same. When you are travelling, you have go to sources of information about your port of call: Marine Pilots, Lonely Planet, Wikipedia and Trip Advisor. If you are very lucky, you find a book about the place like The Leopard about Sicily. If any one knows a great book about Malta, email us but I am sure to find a book or a novel about the Crusades and the Knights of St John. The history here is remarkable, even in this history rich area of the world. 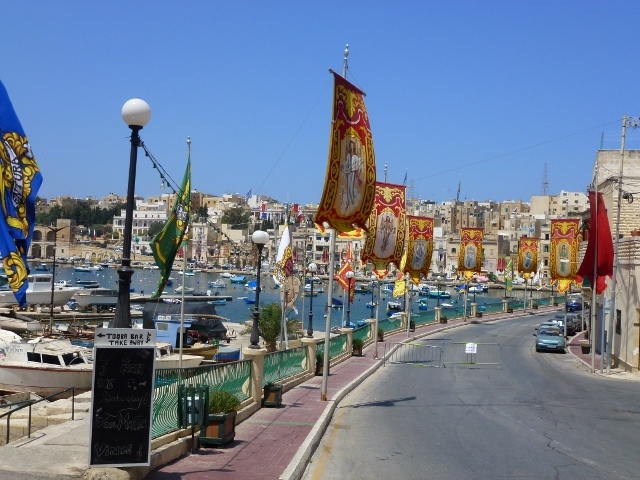 Malta is comprised of three islands, roughly 1/3 the size of Fraser Island or about the same size as the Isle of Wight or Martha’s Vineyard. It has a population of 400,000+. 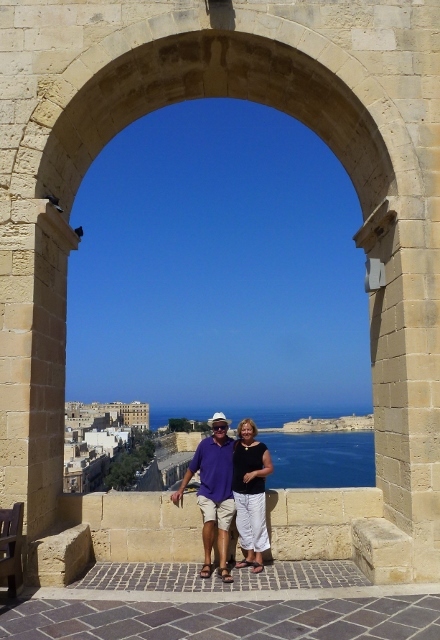 We have spent time walking the bastions of Valetta and the city. Last night we took the bus out to Spinola Bay from Valletta. 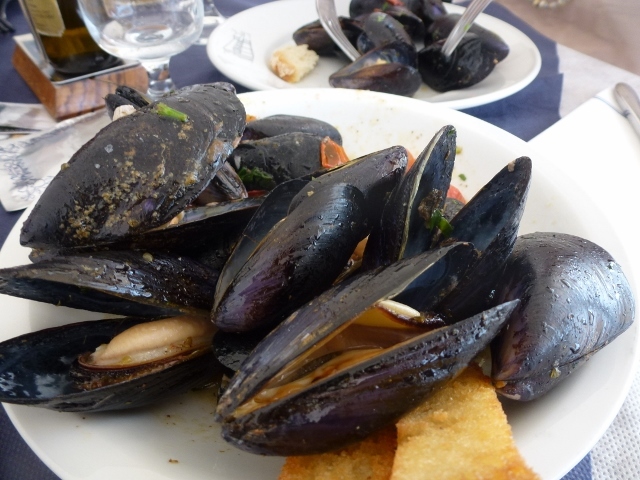 There were several restaurants on the bay and we were lucky enough to find the best mussels in Malta at Ristorante San Giuliano. 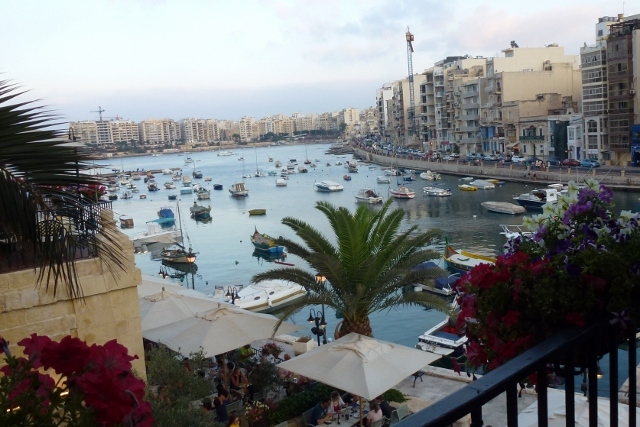 You dine on an al fresco terrace overlooking Spinola Bay, the area is alive with people in boats, walking along the board walk or having dinner and enjoying the view. We are just beginning to explore, so we won’t write much but here are some photos. We left the beautiful ornate Baroque Catatania and motored down to another Baroque but creamy white Siracusa. Stunning limestone buildings, white against the azure blue skies and classical in their architecture. 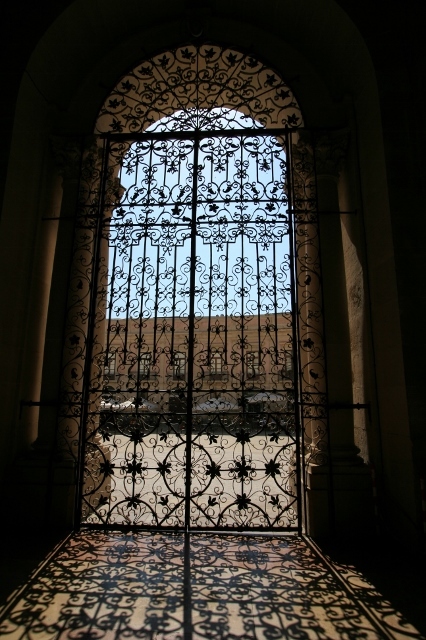 The 1693 earthquake meant the city was rebuilt with many beautiful Sicilian Baroque buildings. 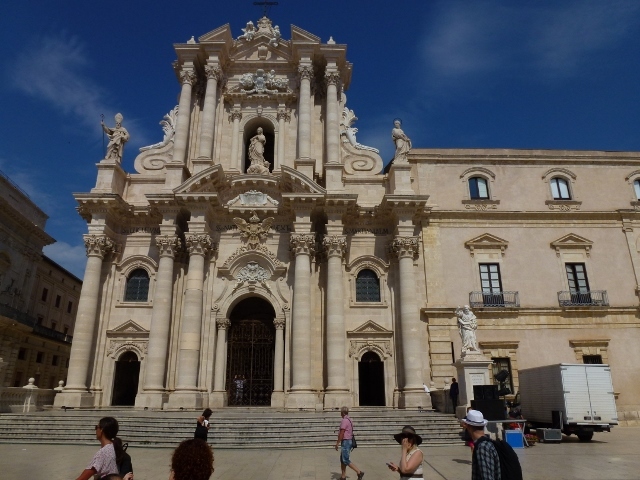 Siracusa has a definite Greek inheritance, they were here early and excavation of two Doric Apollo’s Temple and Pallas Athena temple has been converted years ago into the Catholic Duomo. There is a natural spring of fresh water called the Font of Arethusa. The darling nymph was turned into a spring to save her from the river god Alpheus. 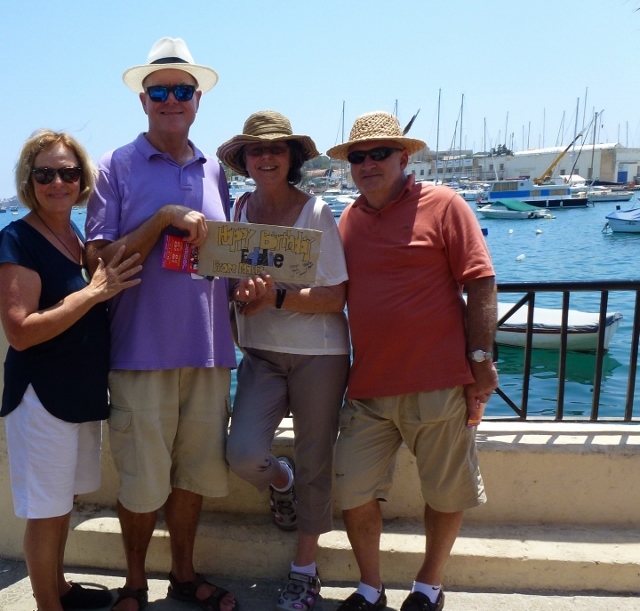 They end up mingled together in Ortygia, on the beautiful island in Siracusa. If fact, last night we could see fresh water bubbling into the harbour. 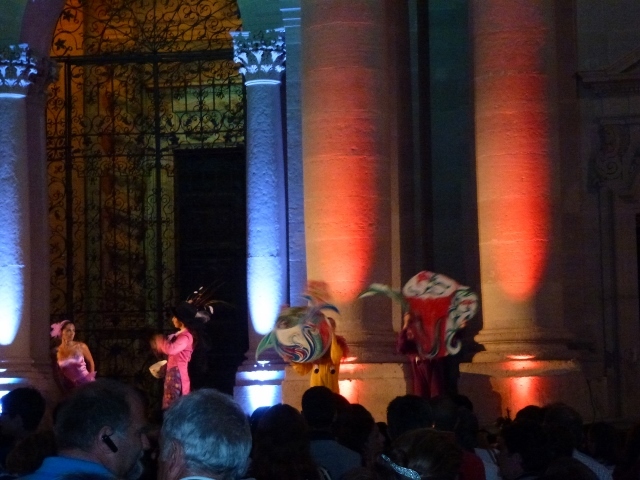 Having missed Vivid Sydney, we were very pleased that the Festa presented us with an opportunity for Vivid Ortygia. The 5th Century BC Temple of Athena, with many of its Doric columns intact, has been transformed into the Duomo today, The theatrical edifice was awash in lights and there was dancing and music playing under the pastel washed columns. There were children out and enjoying the music and dancing, wanting nothing more than to join in with the dancing. 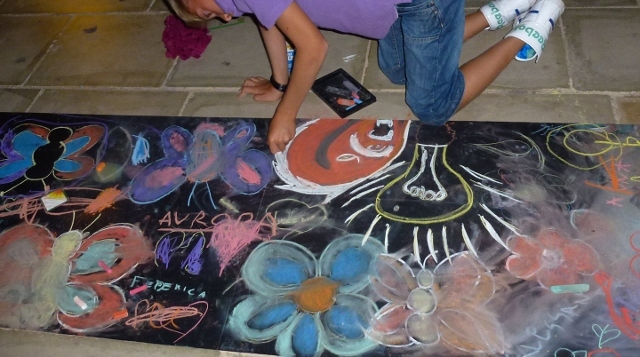 Around the corner young artists were busy creating art of their own.